Newspapers are dying across the country. Local papers are shutting down, Gannett is laying off 3,000 people, the Christian Science Monitor will no longer put out a print edition, and even the New York Times is facing a serious cash crunch. Can citizen journalism fill in the gaps? David Cohn thinks so. Today, he launches Spot.Us, a not-for-profit experiment in community-funded journalism. The site is a hub where freelance journalists can pitch story ideas and readers can pitch in money to pay the journalists to report and write the story. The focus of the site is on local, community issues around the San Francisco Bay area—the kind that supposedly get short shrift by city newspapers. But Cohn hopes to expand the concept to other communities. How safe are San Francisco Bay beaches and water a year after the Cosco Busan oil spill? No dog park in Pacifica? 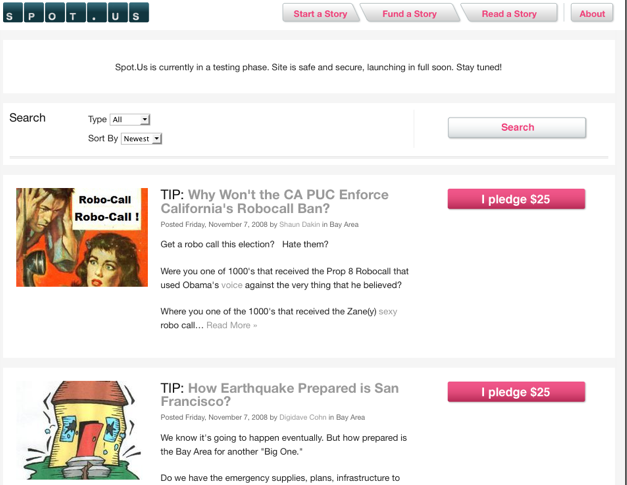 Why Won’t the CA PUC Enforce California’s Robocall Ban? In contrast to other citizen journalism sites such as CNN’s iReport, NowPublic, GroundReport, or CJReport, there is not much room for citizens to participate in the journalism other than voting with their cash and submitting tips. Especially when it comes to local issues, local citizens are often better informed than an outside journalist. But turning the entire process over to readers doesn’t always produce the desired results either, as CNN found out recently withe the false “ireport” of Steve Jobs having a heart attack. The site is part of a trend, though, in what I call mediated citizen journalism. There are still some controls in place. For instance, the Examiner.com is approaching local news by creating a virtual newsroom out of a corps of regular citizens, whose blog posts are vetted. Similarly, TC50 startup IamNews, allows any media site to turn its readers into reporters without giving them access to the publish button. Spot.US could add a little more participation to the process. Also, I am a little bit suspect that the tip jar approach is going to produce quality journalism. Most people don’t care enough about these issues to a pay a couple bucks for the local paper, much less pitch in $10 or $50 to send a reporter out to write a story that they might not see for days or weeks. If Spot.US wants to engage citizens in creating quality journalism, they have to be able to contribute to the research and writing themselves, and even share a byline. Q: How will this work exactly? 1. Anyone can create a “story tip” – and people can pledge to it. An example of a tip. 2. Reporters create pitches – people donate to pitches (real money is exchanged). 3. Finished content is made available to be republished for free UNLESS a news organization buys exclusive rights to an article. If a news organizations wants exclusive rights they must either (a. Donate 50% towards a pitch early or (b. if the community has funded 51% or more – then a news org must donate 100% towards the pitch with extra proceeds going back to the original donor (similar to Kiva.org model). Q: Who can become a Journalist? Anyone can be a journalist. I decided NOT to try and define who is and isn’t a journalist. I thought that would be a step backwards. BUT: On a pitch you must explain your qualifications and journalists are encouraged to fill out their profiles which include giving their work history and work samples. We also encourage donors to look at a journalists profile before they donate. Right now the prices are set by the independent freelance journalists. But you must explain what you will deliver and justify the money you are asking for. Q: How is the money split up, where does it go? 90% of the money goes to the reporter who pitched the investigation. The other 10% goes to an independent fact-check editor that is assigned to the story. This person is actually another journalist in our system, not a Spot.Us staffer. The Fact-Check editor’s job is to do fact-checking and ensure fairness in the reporting. They must approve the final story before it is published. Q: Where does the story appear? Who enforces deadlines? Are there any deadlines? The story will appear on Spot.Us but will be made available to any news organization to republish for free. The only exception to this is if a news organization pays 50% or more towards a pitch. In that case – they get first publishing rights to the article. Q:Why only local stories? Aren’t there big, juicy, national stories that need to be told (and that would attract more funding)? Good question with a few answers. 1. The Knight News Challenge which funded Spot.Us is supporting research and development that would support local reporting. 2. We believe there will always be large national news organizations like the NY Times, WaPo and CNN. But local newspapers are starting to face real hardships and it’s reasonable to imagine a world where local papers like the SF Chronicle, or Cincinnati Enq, etc disappear. These papers played an important role in our local democracies and we want to make sure that the role they played continues. Journalism will survive the death of its institutions. We do hope to expand to other regions beyond the SF Bay Area soon – but we want to prove ourselves in this market before we expand. Q: Is Spot.us set up simply to present pitches, gather tips and funding, or are here tools for letting the crowd help report the story as well? Right now, the only way the public can participate is by donating to a story or creating a story tip. In the future – we want to let them be fact-checkers, leave comments on stories and even donate man-hours towards pitches, instead of just money.